Interesting movie we got here, despite it’s clichéd synopsis of the esper guy who has his limited powers and only can use a great amount of power when cornered like a mouse. I’m sure I’ve watched something with a similar synopsis before. The thing about Ai City despite it’s clichéd synopsis and corny title is it does have more inside than meets the eye, especially it’s visuals, the animation is pretty good and provided some very interesting scenes and allied to the esper/psychic nature atmosphere of the anime, it had some very good scenes in it. It tried to include a wide concept into one hour and half, due to that, some stuff was compressed and left outside of the anime, some other stuff was left unexplained [spoiler] I’m still am trying to figure out what happened there. [/spoiler]. But due to it’s crazy aspect about espers and psychics, I think that the random crazyness of some scenes can be left aside, and better than that, can be widely enjoyed. 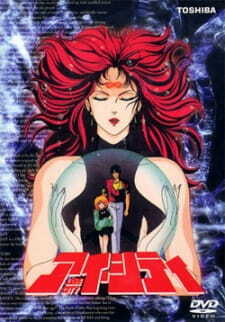 A pretty decent 80s anime movie that will please your hunger for the sci-fi genre of it’s time. Sometimes, people criticize something saying it doesn't make sense. With anime this happens a lot. You can say that sometimes people just don't get, or didn't want to, but sometimes, when someone says something doesn't make sense, it's because, yeah, it doesn't make any sense. Ai City is a good example. Imagine an anime whose script didn't have any sense of pacing, without explaining or exposing anything to you jumps right to an action scene which you can get engaged or excited because you're still wondering what the hell it's going on. That's your first scene. Yeah, didn't sound very promising, but don't worry, the rest is worse. But the premise, if it wasn't for the weird story telling, if there's some story to tell here, is actually pretty conventional. There's an evil scientiffic organization that creates superpowered humans, the most powerful one, who's a little girl, escapes, and the organization want her back. Yeah, pretty cliché. Flash-backs are used pretty commonly on anime, and sometimes can be really helpful to understand characters' motivations, make them more synpathetic and give us clues about the plot resolution. But here? Flash-backs suddenly interrupt, and many of them, until they end, you won't know they were flash-backs, making it even more confusing that it already was. But the worst part is the climax, when, suddenly, cheap and misinterpreted phylosophy starts to get throw to viewers eyes and minds, showing that the screenwritters didn't have any idea about what really those phylosophy tesis where, which is pretty funny because it's actually really basic. Many animes has attempted to talk about the darkness in human nature, but dear God, this it was the most cheap, clumsy, hammy and poorly-written example. Evan in the more shallow aspects the movie can't redeem itself. Animation and soundtrack are pretty dated, and even the cheesy nostalgia factor can save the music. Ai City is a pretty obscure title, and it's perfectly understable why. The few people who had seen it rather erase the memories they've watched it, and i'm one of them. I read the manga version many many years ago.....since then I forgot the name of that already, I tried to search without a clue for long. Once in a while, I came across with this anime version and recognized the plot and the characters. Thanks to the awesome Internet (and MyAnimeList), I could finally put my long-time search to an end. This anime version is somehow different than the manga version, and I am not going to include so here. And I want to say that, this Ai City anime kind of makes me like the bad guys more than the good guys, which is a rare case to me. Despite the fact that Ai City was made in the 1980's, there were some revolutionary sci-fi ideas being added to make this a unique classic. Lastly, I just want to mention again that, I was able to retrieve the manga name of Ai City, all because of my discovery of this anime version. Totally messy action movie with sci-fi, comedy and a bit of romance thrown in. It has potential but eventually the story organization is so bad it's just gonna leave you confused and exhausted. From scene one it's hard to tell who the main character is, there is a protagonist but the screen time is divided between his sidekicks and the bad guys as well so there are lots of characters which gets needlessly confusing. To make it worse most of them aren't really interesting or important. At the 1st half the story is shallow yet fun, the bad guys want to kidnap the hero's girl and the good guys try to protect her. her memory was long erased and the movie starts with her believing the hero, her ex lover, is her father and he plays along with it. this was an interesting story line which disappointingly didn't reach a climax to wrap it up. The last act of the story is incredibly scattered and lacks of reason, just one big wtf full of deus ex machina and there are maybe 4 "final boss" fights. It gets to a point, several times indeed, that is laughably weird and effortlessly explained. The over all production was actually fine, I love the art and coloring of characters and locations, character design of both good and bad guys were nice, the animation is good and also the music had a nice trashy 80s feel to it to fit the cyberpunk mood.